As I am too tight to upgrade to full on paid WordPress service, and the tech heads behind WordPress have some grand nefarious scheme behind not allowing Vimeo videos to be imbedded this quick post is going to be have more blue highlights than a Spanish movie with Penelope Cruz in it. This post is a way-of-letting-you-know-that-this-blog-is-not-dead post, disguised as a post about linking a bunch of really inspiring videos that the net has hatched. First up, speed, cigarettes, Champagne, and banging lots of hot chicks with lots of hair and who grew up to be your mother. That’s right it’s the ITV documentary about James Hunts and Barry Sheen, WHEN PLAYBOYS RULED THE WORLD. One hour but worth every moment of slowed flatmate bandwidth. Watch it on Vimeo HERE. Times really have changed and this documentary does a great job of posting 1976 side by side with today and then asking a few open ended questions. Next up, a 35 minute video about surfing. What? Surfing? Yep, that’s right I said surfing. I should make clear that I think surfing is a beautiful exercise in futility, a reason to get up very early and be disappointed, and probably a good excuse for a fight. The idea of watching surfing gets me to sleep faster than that naughty act of mess, but this film is worthwhile watching. Story, really big powerful murderous waves, and beautiful composition. POWER OF THREES. I had come across this documentary after becoming enthralled by DARK SIDE OF THE LENSE last summer. I watched this short story at least once a day for a fortnight and I still watch it from time to time to remind myself of the where, why and how of anything. 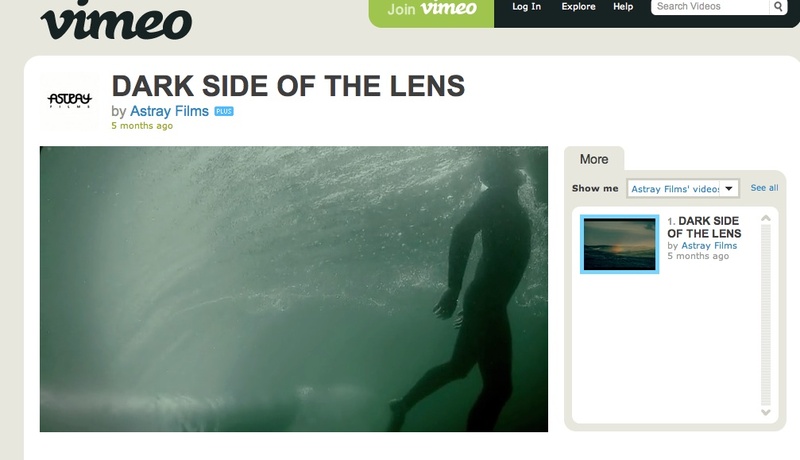 I know exactly what you mean about Dark Side of the Lens, so addictive. A a suprising mix of film and poetry.